Summit Chorale is one of New Jersey's oldest active choral organizations. It was originally called the Summit Choral Society and was open only to women. Founded in 1909 by Esther White, it merged in 1926 with the Summit Glee Club (founded in 1920 by Isreal L. White, Esther White's brother) and the combined group took on the name Summit Choral Club. 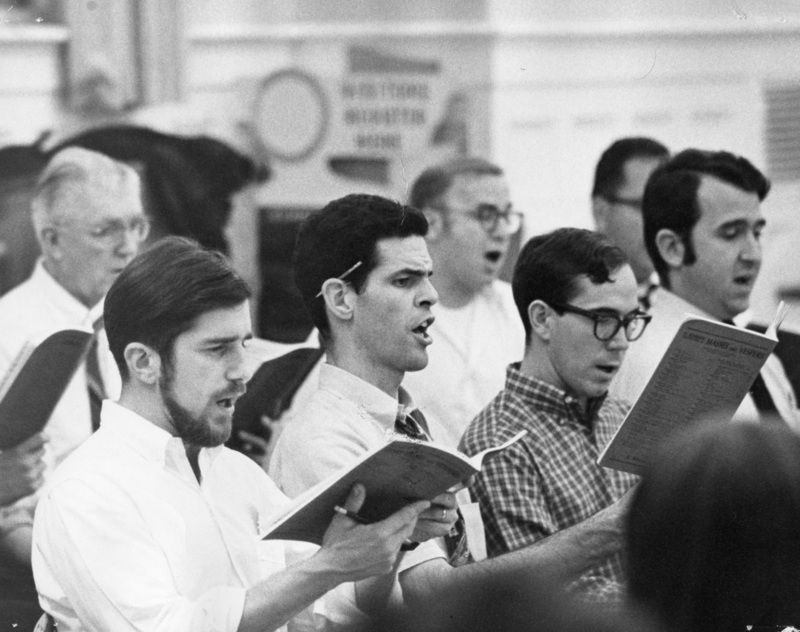 The group later took on the name Summit Community Chorus before evolving to its current moniker in the 1960's. The 1986 merger with the Chorus of M.U.S.I.C. (founded in 1975) from Plainfield brought together two of northern New Jersey's dominant choral groups to create Summit Chorale/M.U.S.I.C., which was later simplified back to Summit Chorale. On the podium, we've been led by such distinguished personalities as Dr. Arthur Woodruff (conductor 1909 - 1926), Louis Robert (1926 - 1937), Lawrence Rasmussen (1937 - 1947), and Ralph Hunter (1947 - 1949 and again 1968 - 1970). More recently David Buttolph (1958 - 1961), William Ramsey (1961 - 1963) and Mark Orton (1963 - 1968) have led the group. Garyth Nair had the helm for 34 years, from 1970 through 2004. Richard Garrin led the organization from 2004-2008, succeeded by our current director, Dr. Thomas Juneau. Our many years of performing have allowed us to build an incredible repertoire which includes such masterworks as Haydn's Mass in the Time of War, Handel's Isreal in Egypt and Messiah, Bach's St. Matthew Passion, Brahms' Ein deutsches Requiem, Beethoven's Choral Fantasy and the 9th Symphony and Orff's Carmina Burana, to name just a very few. We have commissioned several works from local artists over the years. And all this time has allowed us to experiment with various lesser-known works and composers. We have performed well over 600 distinct works, ranging from early music to those written by major composers of today, such as Gorécky and Pärt. During the regular performing season, the chorus presents three programs of fine choral music. That Summit Chorale's artistic excellence is recognized by its peers is evident from the group's guest appearances with leading musical organizations in the region. Numbered among these are performances with the New Jersey Symphony Orchestra, Colonial Symphony, Summit Symphony, Solid Brass, Opera at Florham, Lubo Opera Company, Waterloo Music Festival, Westfield Symphony and the Cathedral Symphony Orchestra of Newark, NJ. The Chorale has also performed at Carnegie Hall, Alice Tully Hall within Lincoln Center and at St. Patrick's Cathedral, New York City. We were there in the first performance of the Summit Orchestral Society, which is now defunct, and for the Chamber Symphony of New Jersey. We've even done some radio in our long history. In 1997, Summit Chorale was named Chorus in Residence at Drew University, forming a new and ongoing partnership toward increasing the music excellence of both organizations. Summit Chorale is composed of talented non-professional singers, chosen by audition. The mid-size choir of 30-40 singers performs more than just the standard choral literature. The members, ranging in age from the twenties to seniors, are drawn from dozens of communities in Union, Morris, Essex, Middlesex, Somerset, Hunterdon and Warren Counties in New Jersey. In addition to concerts and weekly rehearsals, singers participate in publicity and fund-raising efforts, ticket sales, program publication and concert staging. All pay dues and buy their own scores. The Executive Board, elected by the regular membership, establishes policy and handles business and administrative affairs. Singers and Board members serve without compensation.